Warringah Triathlon Club was formed in 1985 to bring together athletes from Sydney's Northern Beaches who wanted to try the new sport of triathlon. Warren Sullivan, Kim Johnston, Allen Edwards, Martin Quinn & Chris Tully trained together in the gym at the Warringah Aquatic Centre and came up with the idea to start a Triathlon Club. The proposed name for the club was Manly Warringah Triathlon Club. However, someone pointed out that name had already been taken by another group of athletes. Hence the name Warringah Triathlon Club (WTC) was adopted. In the first year the club had grown from about 20 athletes to over a hundred. By 1992/93 WTC had grown to 130 members, 86 males and 44 females. The Club is now the largest club in NSW and is one of the largest in Australia with 450+ members. Tony Sattler - 1989 Australian Ironman Champion and two-time Hawaiian Ironman qualifier and top ten finisher. Adam Joyce - 1992 Australian Duathlon champion & 1992 18 year old Athletics NSW state 5km Champion. Adam was 3rd in the 1992 World Duathlon championships held in USA. Marc Dragan - member of the Australian team at both the 1991 & 1992 World Triathlon Championships. Dave Williams - 1992 Australian Universities Triathlon champion and qualifier for the world university championships. Nicky Carlyle - 1992 Australian duathlon age group champion and member of the Australian 1992 triathlon team. Other well know successful triathletes were Richard Smith, Shane Floyd, Sean Vale, Matt Koorey, CallumMcCleod, Simon Skillicorn, Deidre Grace, Guy Wilding, Scott Wood and Richard Hobson. The first Warringah Triathlon Club race was held around 1985/86. The race course was called the "Novice Circuit. It included a 500m swim in Narrabeen Lake, followed by a 2 lap 20km cycle along Pittwater Rd through Narrabeen shops, past the Antler Hotel (now known as the Sands Hotel, left into Ocean Street to Rat Park, finishing with a 5km run around the Lake. In 1994 a group of WTC athletes headed North for a race that Triathlon NSW had thrown together to ascertain the strongest club in the State. WTC came third that year with just a handful of athletes. The next year new President Richard Smith and Garry Sussans made it their job to get the whole club together to Nelson Bay in an attempt to win the State Club Championships. It turned out a very professional affair, the club was represented with 125 athletes. Club members were all dressed in identical uniforms, all staying at the one hotel, partying and racing as a team. A Tradition had started. Warringah that year became the No 1 Club in the State snatching the title from Cronulla Triathlon Club. Since then Warringah Triathlon Club has always performed strongly, placing either first or second in all but one Club Championships since 1995!! 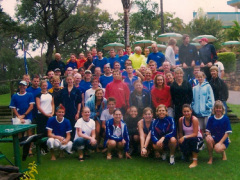 1992 WTC won the inaugural NSW Club Duathlon Challenge Championship. 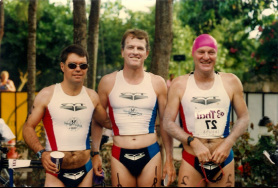 1998 Third in the inaugural Australian Club Triathlon Championship. The Club has a proud history of junior development. This is evidenced by the success of the club in the Sydney Junior Metropolitan Championship and NSW State Junior Club Championship. Many junior club members have been selected over the years to be included in the NSWIS Junior Development Squad they are Yvette Fisher, Fiona Warneke, Angela Jones, Daniel Howitt, Pieter Boer, Jamie Murcott, Scott O'Connor, Sarah Fletcher, Amy Eager, Shaun Thompson, Ben Hammond. Other Warringah Triathlon Club juniors ranked in the State include Gavin Scott, Paul Johnson, Tim Keary, Anna-Marie and Erika Shepherd, Jamie Warren, Stuart Strong, Matt Robertson. Vice President Martin QUINN 1985- ??? Anne Jenkins was later involved with the club.